Karen Hanlon (left) hugged clinic supervisor Eve Kennedy-Spaien on her last day at the Functional Restoration Program for Pain Management at Spaulding Outpatient Center in Medford. She reported her pain had lessened. Fifth in a series of occasional articles on people contending with chronic pain. For previous entries, click here. Little things get Karen Hanlon through the day. Things like the “pain pop” — a Popsicle stick placed in a Dixie cup of water, then frozen. Hanlon peels the paper cup off the ice and rubs the pain pop on the skin between her thumb and forefinger. The cold numbs a nerve that extends up her arm and within minutes soothes her aching neck. Other times, she puts two tennis balls, tied inside a surgical glove, between her back and a wall, and leans into them to massage away a knot. But in finding those simple tools, Hanlon is a rarity. In the age of opioid addiction — when getting prescribed painkillers has grown more difficult — little has been done to increase access to other treatments for the ceaseless pain that afflicts one-third of Americans. “The little things add up, believe it or not,” Hanlon said. She acquired her coping skills at a specialized pain program run by the Spaulding Rehabilitation Network, which serves only 400 to 500 people a year. There, she learned gentle forms of tai chi and yoga, meditation to relax her body, exercises to increase her range of motion, and daily routines to manage the pain. When pain strikes children, the problem is complex — and often overlooked. Read: Can chronic pain be prevented? Perhaps more than any other condition, pain reveals the complex and potent link between mind and body. The tension, fear, and frustration that pain incites can make it hurt all the more. Past trauma can set the stage for chronic suffering by sensitizing the nervous system. One pain condition often leads to another. So chronic pain is rarely an isolated problem that will yield to a single remedy. “We need to come together and see chronic pain in its entirety as something that affects the whole person,” said Dr. Sean Mackey, chief of the Division of Pain Medicine at Stanford University. Mackey was cochairman of the committee that developed the National Pain Strategy , a federal plan for addressing chronic pain. The report calls for greater access to multiple treatment options so patients can learn to manage their pain. Spaulding’s Functional Restoration Program , which started as an inpatient program more than 25 years ago, had to scale back in 2005 after insurers stopped paying for that level of care. Now, participants attend for four or five hours twice a week at Spaulding’s outpatient center in Medford, where doctors, psychologists, physical therapists, and occupational therapists collaborate in coaching patients to manage their pain. 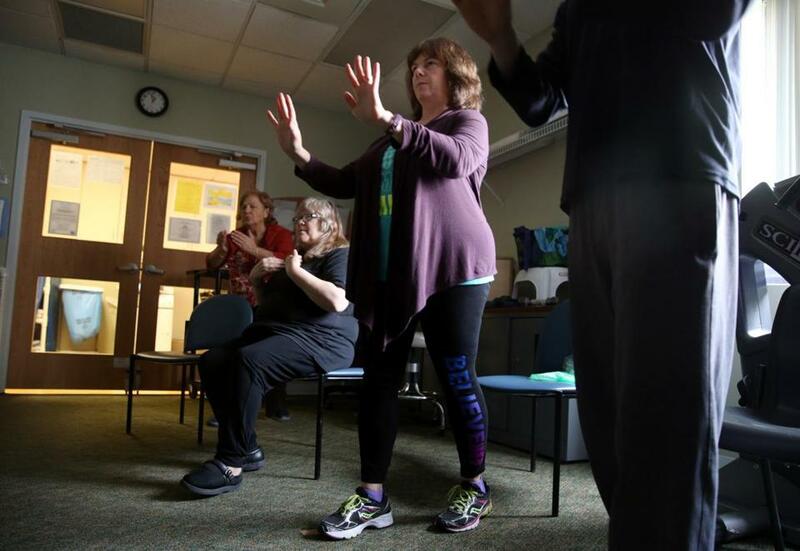 Jodie Berry took part in a tai chi class at the Functional Restoration Program for Pain Management at the Spaulding Outpatient Center in Medford. The program survives by collecting piecemeal reimbursements for each encounter between a patient and a professional. And, with only 10 patients enrolled at any time, the program has a two-month waiting list. Karen Hanlon signed up after a fall reinjured an old neck problem and medications provided no relief. In addition to discovering the virtues of tennis balls and pain pops, she learned that sitting with her legs hip-width apart would ease the strain on her neck and that holding the steering wheel at the bottom would make driving easier. One recent day, a psychologist gave a class in how stress worsens pain by causing muscles to tense, and an occupational therapist advised on pillow shapes and sleeping positions. “The goal is not necessarily to lower the pain level. Because the more emphasis you put on ‘what is my pain level?’ — that by itself increases the pain level,” said Eve Kennedy-Spaien, clinical supervisor. Instead, participants set goals and gauge success by what they can do. Kennedy-Spaien is the calm force driving the Functional Restoration Program, greeted warmly by patients and staff as she walks down the hallways with the aid of two metal crutches. Born with cerebral palsy, she chose her career path — occupational therapy — at the age of 5, inspired by the therapists who helped her. In her teens, her joints and muscles started aching, and she learned how to manage chronic pain. As a mother and full-time worker, Kennedy-Spaien stands as an example for people trying to get their footing amid unrelenting pain. “I practice everything I teach my patients,” she said. Kennedy-Spaien said the program has not been able to track how its “graduates” fare in the months and years after leaving, because so few return questionnaires. Patient surveys at discharge, she said, have found that nearly 9 out of 10 report significant improvement and satisfaction in being able to do the things that matter most to them, and the average pain level has also decreased. Today, Hanlon said, her pain is not gone but reduced to a “dull roar,” with occasional flare-ups. She has learned to head it off with exercise and regular application of a moist heating pad. At age 60, she is feeling well enough to return to the workforce, with plans to start a business with a friend. Jodie Berry finished her eight weeks with the program in mid-December, her pain no better but her spirits soaring. For four years, she has suffered with pain that starts deep in her hip and shoots down her legs, wrapping around her thighs. Prescribed opioids caused a bad reaction and other painkillers didn’t help. Recently, Berry decided to make cookies for a party. That required what pain specialists call “pacing.” She interrupted her work in the kitchen three times — once to exercise, once to give herself an ice massage (pain pop rubbed on sore spots), and once to meditate. But by day’s end, the cookies were made. She got to enjoy a night at the theater for the first time in months. That took an ice massage before leaving the house, sitting on ice packs in the theater (another lesson from Spaulding: Palmolive detergent stays frozen longer than water), and standing up for part of the show. “I have a lot of skills that I have mastered, and more that I’m continuing to work on, and those things are going to be enough to get me back living my life,” Berry said. In fact, in January she plans to return to her beloved job working with young mothers at Beverly Hospital. Pain pops — paper cups of ice with a Popsicle stick inside — help Karen Hanlon manage her pain by soothing a nerve that runs up her arm. Each patient needs to tailor a combination of solutions for living with pain, said Michael Von Korff of the Group Health Research Institute in Seattle, a leading researcher in chronic pain management. Where patients are getting care is at their primary care doctor’s office — a place already overburdened and ill-equipped to deal with the complexities of chronic pain. Atrius Health, another large medical group, is experimenting with group appointments for chronic pain patients. In these shared meetings, several people gather for more than an hour, sacrificing one-on-one attention for more time — and the opportunity to learn from a variety of professionals and other patients with similar problems. Another group of primary care providers — community health centers that serve low-income people — are tackling the problem with technology. A Connecticut nonprofit, the Weitzman Institute, gives primary care physicians regular access, via videoconferencing, to a roomful of experts. Called Project ECHO, the program is offered to 24 provider groups across New England, mostly community health centers but also private practices and academic centers. Project ECHO started as way to address opioid prescribing and the tendency to hand every pain patient an opioid pill. But curtailing opioid prescribing still leaves the pain, said Dr. Dan Wilensky, a family practice doctor at the Community Health Center in Connecticut. “You can’t separate our chronic pain epidemic from our drug epidemic in America,” he said. Wilensky’s health center has reorganized to address the emotional and lifestyle aspects of pain. It engaged its own psychologists and therapists in pain treatment; forged links with physical therapists; and began offering meditation training, nutrition counseling, tai chi, yoga, chiropractic, even dance. The health center is able to participate in Project ECHO through a grant. But the hope, Wilensky said, is to convince those who pay for care that such approaches are worth the cost. Harvard Pilgrim Health Care sees potential in “bundled payments,” in which doctors are paid based on how well they take care of patients, rather than getting a fee for each procedure. Such an approach has been applied to other chronic illnesses, such as diabetes, and would work well for chronic pain, said Dr. Michael Sherman, chief medical officer. But Harvard Pilgrim hasn’t developed such a program for pain — stymied, Sherman said, by a lack of multidisciplinary pain clinics that could be partners. As a result, people such as Margaret FitzPatrick of Medford are left to piece together their own programs of care, pay for some of it out of pocket, and forgo needed care when the money runs out. FitzPatrick suffers from fibromyalgia, a syndrome of muscle aches that forced her to leave her job as a first-grade teacher. She has found four things that help, each in a different way: the anticonvulsant drug gabapentin, visits to her psychotherapist, acupuncture, and massage. Of the four, her insurance — the state Medicaid program known as MassHealth — covers only the drug. Because she is out of work, FitzPatrick, 51, can no longer afford the $70 per session for massage and acupuncture. Her psychotherapist doesn’t take insurance because the reimbursement is too low and hassles too great, so FitzPatrick pays a reduced fee out of pocket. FitzPatrick’s doctors support the alternative therapies, but she was alone in finding them and paying for them. And now she is getting by without them.